Vera Wang 18ct white gold 70pt diamond cushion halo ring is rated 5.0 out of 5 by 3. Rated 5 out of 5 by Anonymous from The perfect ring This ring is beautiful in every sense of the word. I have had endless comments about it. I looked at plenty of rings and kept coming back to this one. If you want to show off a ring, look no further. 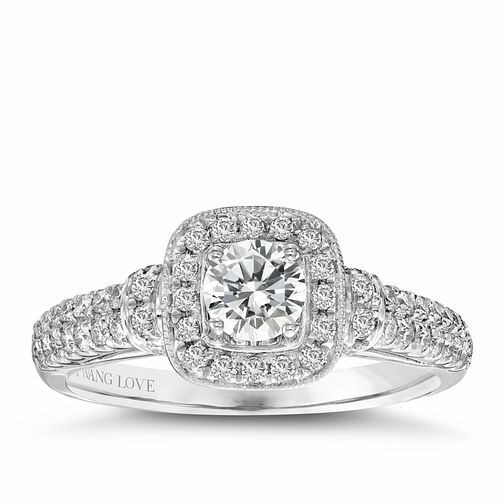 This ring oozes elegance and sparkle. Rated 5 out of 5 by Anonymous from Perfect!!! After 13 years of waiting my now Husband proposed to me officially with this ring and OMG it is amazing, stunning, sparkly and literally PERFECT!!! Any woman who is lucky enough to receive this as their engagement ring will never be able to complain......Vera Wang completely created the most perfect engagement ring and woman could wish for!! The service in the store in Milton Keynes was fantastic and we went back and purchased our wedding rings as well! !